Eight skippers assembled for the first race in the Martin Dale Cup RG65/Micro 540 series, considering the RG65 yachts have been the mainstay of the competition for the last two years, it was a little disappointing to have only two competitive boats on the water, both of them Dragon Forces. Almost all of the Micro 540's that have currently been built took a turn on the course with different skippers at the helm. Two Islands John Simmons deserves a mention as he popped by to collect his Wee Nip parts and stayed to race almost the entire competition finishing a creditable fourth. The course was set as three gates with avoidance of the Start/Finish line a priority, out on the water it was quite a strong breeze, 20 to 25 mph , almost at the limit of the Micro 540's ability, Mike Ewart was able to drop down to his smallest suit of sails and his Dragon Force went very well in the strong wind conditions it was built for. Paul Risdale was the provider of a small fleet of Micro 540's all of which sail very well and are all built to Pauls impressive standards, these were borrowed by Brian Hawkins and John Simmons respectively. Brian could only manage a few races as he had to leave early and John's score was affected by not knowing he was going to take part. The strong wind was really testing out the build quality and components on all the boats, Geoff Raygada's Gothic 540, was a little tender for the strong wind however it will probably go better when conditions are a little easier. Peter Jackson Wizard was forced to retire after a collision which left him with a broken back stay crane, not fixable at the lakeside and so we end up with the story of my boat. If the details of this event seem a little sketchy it is because I spent most of my time with my nose, hands, pliers, tape and anything else I could utilise inside my boat, however the story really starts earlier in the week when PJ offered to "sort the paint" on my Abracadabra, I had tried painting it three times in White Halfords Enamel paint each time with less successful results than the last and so it sat as an abandoned project waiting for me to summon the heart to have another go. PJ decided to take pity on me and said he would help me by finishing the paint work, ever the opportunist I said there might be a "few" other bits that needed fitting to get it ready for this event, I provided him with sail & rudder servos rudder linkage, switch, two fair leads two cans of spray enamel oh and the information that originally the boat was intended for a swing rig but having used Pauls yachts I think the way to go is Bermuda Rig so the solid bulkheads would need cutting to allow for this! Needless to say PJ rose to the challenge and had the boat at the lakeside looking great with everything other than the receiver, deck patches and sheet leads in place. The problems I had experienced were apparently down to the rubbish paint I bought PJ couldn't get it to work either, in the meantime had made the sails from some marks I had made on the template and a couple of prayers that when fitted on the boat they would work and still be in class. Once the usual formalities for the event were over I set to work on my boat threading the sheet lines, fitting the receiver etc marrying the sails to the yacht and general doing a couple of checks before launch this meant missing the first two races however I was able to make the start of race three where Abracadabra came second behind Mike's Dragon Force, race four saw a first place finish and then whilst she was on the water she was consistently the highest placed Micro 540 on the water, with the exception of one race, it remains to be seen how she goes in lighter wind conditions. A change of battery saw me out of race 7 and then as the wind strengthened I determined I needed to increase the rudder throw, unfortunately having removed everything to get at the servo arm, and taken it off, no mean feat in this little boat I eventually discovered I didn't have another one to fit the servo I had given PJ and had to put it all back missing race 9, 10 and 11 in the process. Once again the little Abracadabra proved the rule that the more trauma and hassle you have building a boat the better it goes, overall I finished third, way beyond my expectations and not bad for a boat that hadn't even been in the Armitage Shanks test tank at home! In a nutshell, Mike Ewart went on to beat the score card finishing with a very impressive 13 points sometimes by a reasonable margin, sometimes by not very much Peter Jackson did a great job running the event rowing out to alter the course and bring it a little more inshore when conditions got a bit hairy, it was a shame he wasn't able to complete more races. Paul Risdale sailed consistently well, thrown in at the deep end John Simmons got to grips with these little yachts quite quickly, Alan Smedley was going well until the electronics on his Dragon Force failed. Geoff Raygada lives to fight another day when hopefully the conditions will better suit his more tender yacht, and Brian Hawkins came, raced and went home happy. 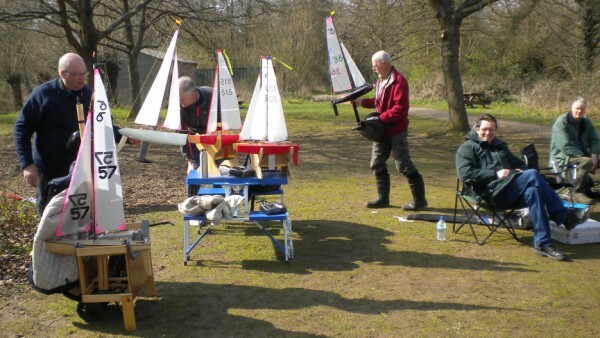 The Daventry Country Park really is a lovely venue and as usual much interest was aroused with the local users of the park seeing our yachts on the water the next event here is again the Martin Dale Cup on April 26th.